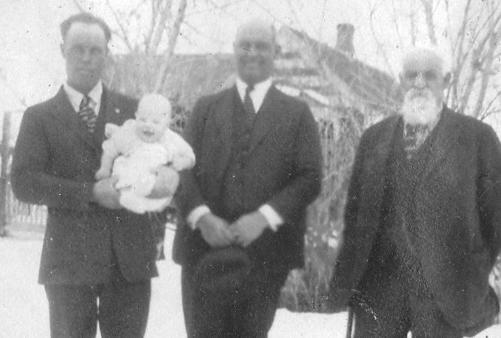 David Harry Toyn, a patriarch in the Raft River Stake and Bishop of the Grouse Creek Ward, Box Elder County, Utah from 1896 to 1916, was born on May 1, 1849 at Cambridge, Cambridgeshire, England, the son of Charles Toyn and Harriet Porcher. His father, Charles, served as a body guard to Queen Victoria. Charles was called from that service in 1854 to go to Bose Island (one of the Bermuda Islands) as a prison official, or turnkey. One of his duties was to count the prisoners on their way to and from work. They lived on this island for five years. During this time three children were born, two of which died of yellow fever and were buried on the island. Charles, the father, contracted yellow fever and died. He was buried beside his children on the island in the Catholic cemetery. After his death, Francis, his wife, with her three children, Charles, David and Eliza, migrated to New York where her sister Sarah Houghton lived. After settling in New York, Francis Harriet went to work for private families in order to support herself and family. David and Charles first worked in a lumber yard bundling lumber for kindling. Later they worked in a bakery preparing bread for soldiers. Later David worked in a leather factory. After two years of hard work in New York, Francis had saved enough money to continue their journey to Utah. (Francis had joined the Mormon church while in England and her husband was also converted but hadn’t joined at the time of his death), but Brigham Young, at that time President of the Church, advised Francis to remain in New York and use the money to send her father and mother to Utah. He promised her if she would do this that by the following year she would have enough money for herself and family to come. Although she doubted it some, it all came true. She sent her father and mother and she and her family came to Salt Lake City the following year, crossing the plains in the Henry W. Miller Co. which arrived in the valley on October 17, 1862. David went to work for a man by the name of Barnabus Adams, who ran sheep and cattle in connection with Ben Hysel. He later worked for John Green at Battle Creek (Pleasant Grove), then in the fall he went with John Green and family to North Bend Sanpete (now Pleasant View). “I then went to work for another man. Mrs. Green liked me very much and disliked me to be in the same settlement and not be with them so she offered to give me food and clothing and wanted me to go to my home at American Fork. I loaded my things on a steer I had and started home. I went by way of Mount Pleasant down Salt Creek Canyon and on to American Fork. When I reached home I found my mother had married a man by the name of John Sykes. I lived with them about two or three months. I was fifteen years old then. That spring I hired out to a man by the name of Mr. Bechstead of Pleasant Grove. I worked for him all summer and the following winter. That winter six of us men bought a placer mine to pan gold for a living but soon found out there wasn’t enough gold to support so many so we hired out at different places. I hired out to a man herding oxen with a definite bargain that I should work all winter for my board. The cattle were all mortgaged and sold the first of the year. The man tried to let me go but I held him to his promise to hire me for the winter. He finally hired me out to a man to herd sheep. There came up such a blizzard I couldn’t drive my sheep against it and they milled. The thermometer registered forty degrees below zero. There was a family living at Stone Bridge and one of their daughters became worried about me. She saddled a horse, wrapped a robe about her to protect her from the cold and blizzard, and came in search of me. When she arrived, I was numb and crying with the cold. With her help I was able to climb on the horse and she took me home. My mother protested against my going to Montana and when I passed through these hardships I thought of home. I worked during the summer and returned home that fall. After returning home I worked for a man by the name of John Picknell and while there I learned the butchering trade. 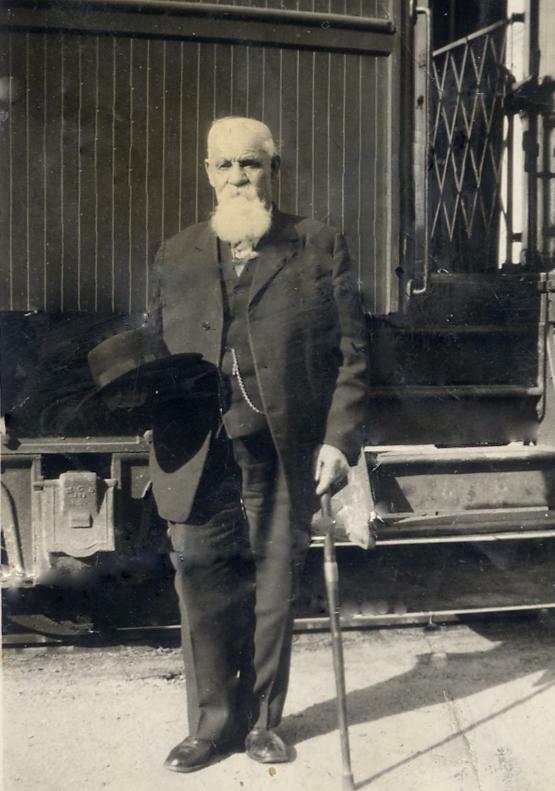 In the year of 1869 I hired out to Feramore Little building railroad grades. It was the Union Pacific road through Echo Canyon. After working there for about one and one-half years I, in connection with another young man, was asked to dynamite Pulpit Rock down as they were afraid that the vibration of the moving trains would shake it loose and cause it to roll down. Before the shot went off the contractor received a telegram from the railroad company saying, “Don’t blow Pulpit Rock down,” so for many years the shot lay with powder and fuse ready to light. After grading I made another trip to Montana from Corinne, Utah, then freighted one summer from Fort Benton to Helena. 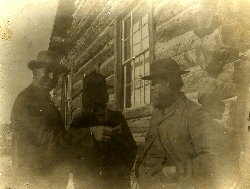 I returned to Utah and went into the butchering business at Silver Springs, Big Cottonwood Canyon with Richard Papworth. While there I met the lady that later became my wife. I married Martha Jane Davis, daughter of John Meeks Davis and Elizabeth Abshire, on January 19, 1874. She was born at Council Bluffs, Iowa. We then moved to Murray, Utah and lived with Martha’s parents. We went into the butchering business for one year while there. This marriage was blessed by eleven children. Martha Jane had previously been married to William Jackson, and had two children, William and Mary Elizabeth. He raised Mary Elizabeth, also, and had her sealed to him in the LDS Temple. The eleven children in order of their birth were: David Adams, Francis Harris, Charles Crawford, Thomas Spencer, Ann Eliza, Alma Harry, May and Mamie (twins), Cora and Nora (twins) and Joseph Edgar. In 1876, with one yoke of oxen and a wagon I moved my family to Stockton, Utah and from there we moved to Tooele City. In the fall of 1877 the five families named above returned to Grouse Creek and settled there on the north part of the Sam Kimball place. They were faced with quite a serious problem arriving there in the fall with their wives and children. They set to work and made a dugout which they lived in all winter for comfort. There was a small colony of people moved to Grouse Creek just ahead of David and company known as the “Heneferites” because they were from Henefer. They were Albert Richins, Philip Paskett, William Paskett, William Betteridge and James R. Simpson, together with their families. The following fall we moved up on the ranch (located three miles north of the present church house). I tore my house down and moved it upon the ranch. There were some Indians located on the ranch spot and I gave them a pony for their holdings. I lived there on squatters rights until it was surveyed, then I homesteaded it. In July 1879 Church authorities of Box Elder Stake came to Grouse Creek and organized the Grouse Creek Ward. We had built up the country and made it a pleasant place to live. The majority of people were poor and money was scarce. One day the Bishop received a call from the Logan temple to raise $15.00 in the ward to assist with the painting and finishing work of the temple. He asked me what I would be able to donate. I told him I had only $1.00 to my name and had promised to pay it on a debt I owed the following Sunday. We talked awhile and when he was ready to leave I told him I would donate the dollar I had and trust to providence for another one for Sunday. The week passed and no dollar came. On Sunday morning I went to the schoolhouse for Sunday School. Four or five men were standing on the steps and as I walked up I saw a dollar lying at their feet. I picked it up and asked all present but was unable to locate the owner so I paid my debt. That was my first donation toward the building of the Logan temple. I hauled a load of wool to the railroad for a sheep man who accompanied me. He seemed to take a fancy to one of my horses and wanted to buy it quite badly. I told him I couldn’t spare the horse because I was dependent on it to make my living. He told me he would pay me $100.00 and I could use the horse the rest of the summer. The following morning I got the storekeeper to cash it for me. I had thirty miles to ride home alone and plenty of time to think how to spend it when a pleasant voice came to me, “Pay your tithing.” I spoke up aloud, “no, I never will, I need all this money for my family.” In a few minutes I was thinking again what I should do. “Pay your tithing” spoke the voice again. I answered, “I cannot see how I can, my family is in poor circumstances.” After a time I was thinking again when the same voice spoke a third time, “Pay your tithing then make preparations to go to the Logan temple this fall and take all your family, nine in all.” The voice instructed me thus, “you have your family all at home now and it won’t be long before some won’t be home. Now is the time to attend to this.” I paid my tithing on the way home to Philip Paskett. The first night en route to the temple we camped at the forks of the road. One road going to Salt Lake and the other going to Logan. There was another camp near us, strangers to us. The following morning he hitched up his team to continue his trip to Salt Lake and we were preparing to go on to Logan. When we were ready to leave, this young man came over to me and said, “Where are you going?” “To Logan,” I replied. “What for?” he asked. “Going to the temple,” I replied. “The temple is closed,” he advised me. “You had better come on to Salt Lake if you have any friends there and attend conference. After conference the Logan temple will reopen and you can go there on your way back.” It appears to me this young man was inspired to give me this advice for I was ignorant of it all. I accepted his advice and went to Salt Lake and stayed with Lizzie Payworth. We attended conference and enjoyed it very much. After conference we made our way back to Logan and was directed by the spirit in all our moves. We did our temple work, clothed our children and returned home with some of the $90.00 still in my pocket. The trip was about 500 miles by team. This experience prepared me for responsibilities ahead of me. Soon after I returned from Logan I was ordained a high priest on July 3, 1892 and put in first counselor to Bishop Charles Kimber where I served for about four years, then I was called to preside over the Grouse Creek ward for a year. On April 20, 1896 I was ordained a Bishop with William P. Paskett and Albert E. Richins as my counselors. We met on a Saturday night and it was agreed by all that I should be Bishop. Apostle John Henry Smith told me to go home and make a choice of counselors and we’ll see if the women will sustain you. I retained William P. Paskett because he had served so faithfully with me in the former bishopric. I couldn’t enter upon any one for second counselor. I lived three miles from the church house and on Sunday morning while traveling with my family to church one of the children said, “A white top buggy is coming up the country,” and the spirit said to me, “He’s your other counselor.” When we met Brother Richins he stopped his team and asked me to let one of the boys drive my team while I rode with him. He asked me to forgive him all that he had done and said against me. He picked up another companion on the way and he also asked my forgiveness. It continued until the fourth one had asked my forgiveness for they had surely opposed me the evening before. When I told Brother Smith whom I had chosen for my second counselor, he commended me on my judgment. It was not my judgment, it was the whisperings of the spirit. I am pleased to say we spent twenty years of prosperity as a ward. David was baptized on June 11, 1862 by William Horspool, ordained a Deacon by Benjamin F. Cooke, on July 27, 1879, ordained a Priest on October 28, 1883 by Charles Kimber, ordained a Seventy on December 28, 1884 by Lorenzo Hunsaker, ordained a High Priest on July 3, 1892 by Rudger Clawson. He was ordained a Bishop on April 20, 1896 by John Henry Smith and released from that position on April 24, 1916. He was ordained a Patriarch of the Raft River Stake with headquarters at Malta, Idaho, by Apostle George F. Richards. David died at the home of a son, Alma, in Ogden, Weber County, Utah on May 29, 1938 at the age of eighty-nine. He was buried beside his wife at Grouse Creek, Box Elder County, Utah.